The Hamilton Travel Bar - Black features padded compartments to hold bottles, Customizable with your logo to create impressive Company Logo Products. 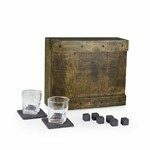 Our Whiskey Box - Oak Gift Set features glasses, coasters and whiskey stones and allows customization for Personalized Giveaways. 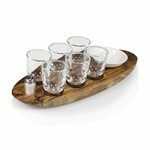 The Cantinero Shot Serving Tray features acacia wood construction, Customizable with your logo for Brand Recognition. 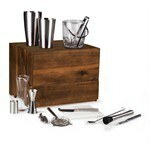 The Madison Table Top Bar features cherry stained acacia box and allows adding custom logo and message for Brand Recognition. 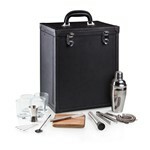 Our Manhattan Cocktail Case features suitcase style carrying handle, Customizable with your logo for Corporate Swag. 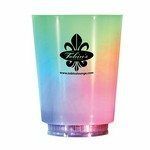 The 10.5 ounce Bergen On The Rocks with Jet-Directt Full Color Imprint 10.5 ounce capacity is a glass with a stepped bottom. This 10.75 ounce Oxygen On The Rocks glass has a round shape for comfort and elegance. 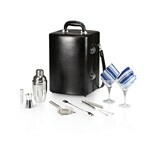 Our 16 ounce Bergen cooler with Jet-Directt Full Color Imprint features a stepped bottom. Our 16 ounce Oxygen cooler drinking glass features a unique oval shape for comfortable grip. The Color Changing LED Mood Glass has a compact, classic shape that is perfect for cocktails, iced water, or juice. Recognize talent with the Custom Etched Crystal Deluxe Barware Highball Glass, imprinted with your personalized logo in one location.